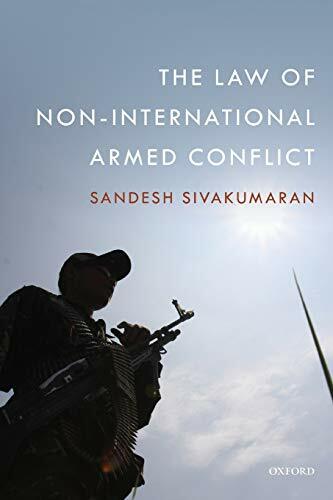 The Law of Non-International Armed Conflict brings together and critically analyses the disparate conventional, customary, and soft law relating to non-international armed conflict. All the relevant bodies of international law are considered, including international humanitarian law, international criminal law, and international human rights law. The book traces the changes to the legal framework applicable to non-international armed conflict from ad hoc regulation in the nineteenth and early twentieth century, to systematic regulation through the 1949 Geneva Conventions and 1977 Additional Protocols, to the transformation of the law in the mid-1990s. Armed conflicts ranging from the US civil war, the Algerian War of Independence, and the attempted secession of Biafra, through to the current conflicts in the Colombia, the Philippines, and Sudan are all considered. The identification and analysis of the law is complemented by a consideration of the practice, allowing both violations of, and respect for, the law, to be ascertained. Given that non-international armed conflicts are fought between states and non-state armed groups, or between armed groups, particular attention is paid to the oft-neglected views of armed groups. This is done through an analysis of hundreds of statements, unilateral declarations, internal regulations, and bilateral agreements issued by armed groups. Equivalent material emanating from states parties to conflicts is also considered. The book is thus an essential reference point for the law and practice of non-international armed conflicts.